The ZIPANG Mesopotamian storytellers first performed in 1997 at the Kufa Gallery in Bayswater, London. The original ZIPANG storytellers were Fran Hazelton, June Peters and Fiona Collins. Fran Hazelton (top picture) is the grand-daughter of a music-hall entertainer. She studied politics, philosophy and economics at St Hugh’s College, University of Oxford, and the myths and rituals of the Ancient Near East at the School of Oriental and African Studies in London. She took up Mesopotamian storytelling in 1997 and is the author of two books of retold Mesopotamian stories: Stories from Ancient Iraq and Three Kings of Warka. Fran is also the chairperson of the Enheduanna Society. June Peters (middle picture) is a professional storyteller who specialises in ancient Sumerian stories as well as stories from other cultures. She has more than 20 years experience as a freelance performer, language and literacy consultant, and workshop leader using story and music. 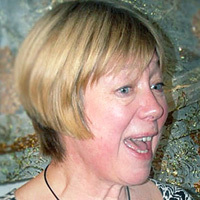 She interprets and facilitates public spaces through story—the British Museum (she once told a story in the old library in the presence of former US president, George Bush), Wisley Gardens, Kew Gardens and art galleries including the National Gallery, Saatchi Gallery and the Courtauld Institute. She is a past chair of the Society for Storytelling. Click here to visit June's website. Badia Obaid (bottom picture) was born in Iraq and studied dramatic art at Baghdad University. She has a wealth of experience as an actor, presenter, writer and producer in theatre, radio, film and television. 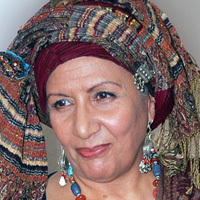 As an Arabic-speaking ZIPANG storyteller she developed a retelling of the Gilgamesh Epic for a performance at the British Museum. 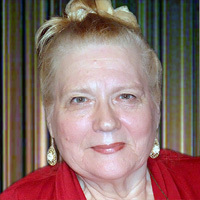 She is keen to communicate to a modern Arabic-speaking audience the Sumerian poetry composed by Enheduanna 4300 years ago. Click here for information about the patrons and trustees of the Enheduanna Society.